The first beer I ever reviewed here on PintLog was Independence Brewing's Austin Amber Ale, a tasty little Amber with a gorgeous label. Well, it's been a few years and I figure it's time to review another of their beers. For the follow-up I settled on their Bootlegger Brown Ale. Smooth, chocolaty, and easy-drinking. 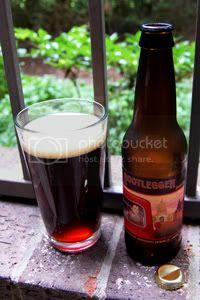 Bootlegger has a distinctive, chocolaty flavor. [It's] is medium-bodied and filtered for a clean, laid-back finish. On the label, there's another piece of gorgeous artwork, featuring a depiction of a bootlegger driving down Congress Avenue outside of the Texas Capital. If the beer is half as good as the artwork, it should score well. Appearance: A slightly hazy, dark brown body with pumpkin highlights. Up top, a half-finger of tightly-packed and cream-colored head that recedes rapidly, leaving a ring around the glass and little lacing. Aroma: First up, a wave of coffee. Not dark-roasted espresso, but regular black coffee, (similar to New Belgium's Giddy Up). There are plenty of chocolate and roasty malt notes to back it up. No hops. Taste: The coffee flavors keep going strong with lots of chocolate, roasted malt, nuttiness, and dark fruit. Some mild hops in the finish. There's lots going on here, but everything meshes in a way that keeps it pretty straight-forward. This is very much a sweet beer, but not cloyingly so. Mouthfeel: Medium-bodied and silky smooth with good carbonation. The hops in the finish dry the sweetness up a little. Drinkability: An easy-drinking beer, this would be a good session choice. Verdict: Independence have crafted a charming little beer here. Lots of different complementary flavors come together to give Bootlegger a good amount of character (something many Browns are missing) while still having a lot of sessionability. Solid. This beer intrigues me, I really want to find it. I'm a big fan of brown ales that are full of taste. I'll come follow up if I do have it.